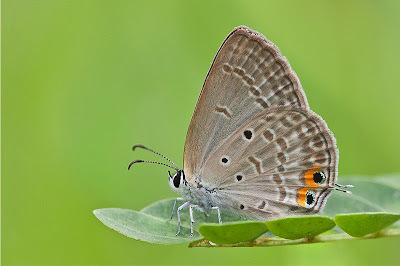 An additional shot for our random gallery this week, by our junior ButterflyCircle member, Jonathan Soong. Our 13-year old teenage talent consistently produces work that is on par with the seniors, and far exceeds that of many 'weekend photographers'. In this shot taken last weekend, a nicely composed Gram Blue sitting on a leaf of a Leguminosae accentuates the butterfly with a clean background. The leaflet 'triplet' below the butterfly frames and underscores the subject effectively, giving an eye-pleasing composition. The Gram Blue is moderately common and can sometimes be abundant in certain locations at times. One of Its recorded host plants, Pueraria phaseoloides. a ground creeper, usually grows in open clearings in bright sunshine. The butterfly is active during the hotter hours of the day, and is skittish. But it settles in the later hours of the day and stops amongst the low shrubbery and tall grasses to rest.